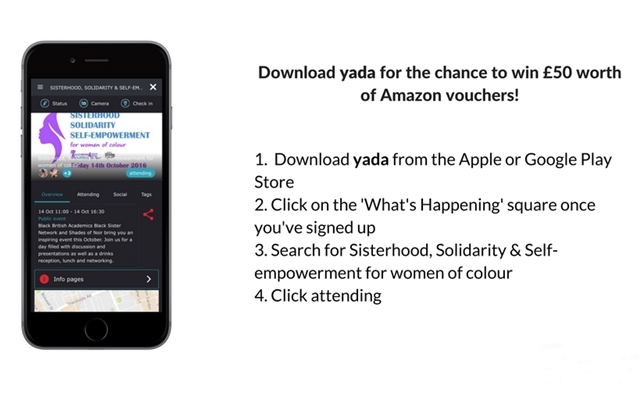 yada Events app have been running a competition with Black British Academics for one lucky event page attendee to win £50 worth of Amazon vouchers. To enter all you have to do is download the app, search for this event in the ‘What’s Happening’ section, and click ‘attending’ at the top of the event page. 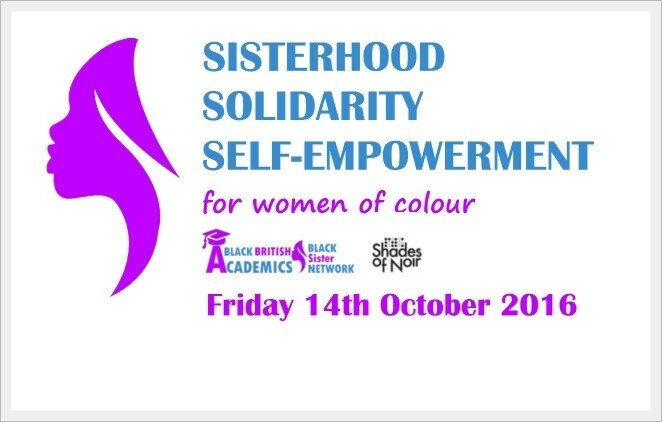 We (Abi Browning and myself) had a brilliant Friday at University of the Arts London for the Black Sister Network/Shades of Noir Sisterhood, Solidarity and Self-Empowerment for Women of Colour in HE event. There was a panel of speakers who gave their personal experiences and theories on how women of colour fare in higher edcuation. 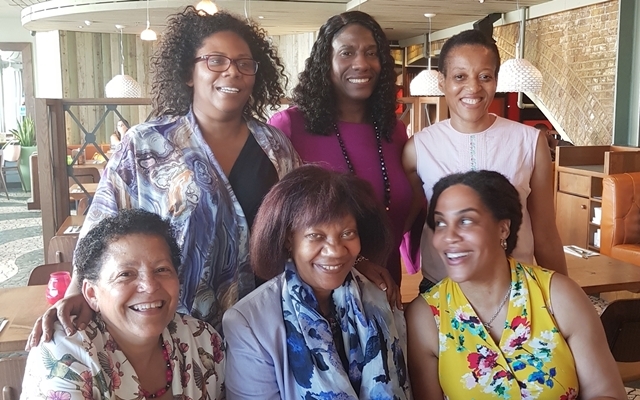 These academic figureheads included: Dr Deborah Gabriel, Dr Shirley Ann Tate, Dr Marcia Wilson, Prof. Heidi Safia Mirza, Dr Elizabeth Opara, and Aisha Richards. Their talks were incredibly moving and honest about the accumulative impact of raced and gendered discrimination. The standout phrases that came up repeatedly were terms such as “Objectified”, “Othered” and “Dehumanised”. The message of Sisterhood was clear throughout this meeting and Dr Gabriel continued to stress the necessity of providing support networks for women of colour who do not always have access to support in male dominated industries such as academia. Dr Elizabeth Opara explained how her experience of the science and research sector of education was that it “is very macho… it’s top heavy with men”. What was overwhelming was the communal sense of disappointment angled towards the structures of employment in universities and teaching in the UK. 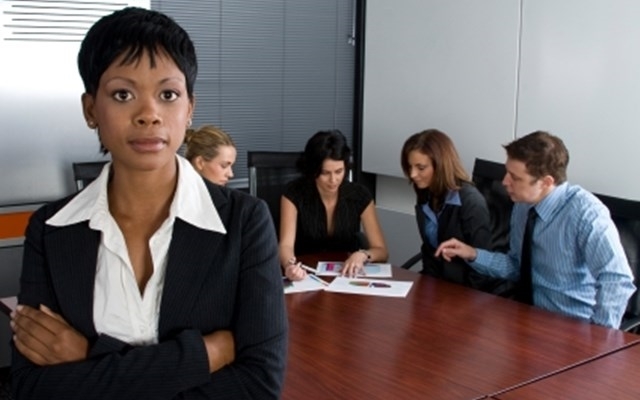 Of how “employer wellbeing” plans have become breeding grounds for institutionalised racism. This is clearly a flaw in the system that has to be exposed. “You have got to make sure that your voice gets heard.” – Dr Marcia Wilson. Another key issue raised in the discussions surrounded the power dynamic between students, particularly PhD students and their supervisory tutors. This relationship has always been weighted due to the power a tutor has to affect individual grades. However, what came out of the experiences of individuals on Friday was that, regardless of institutional rules and strictures in place to prevent bias, any tutor has the opportunity to abuse their power over their students. Some certainly take this opportunity. “How you treat your women in your colleges tells you something about your colleges or universities.” – Prof. Heidi Safia Mirza. After short talks given by the female academics the floor was given to two graduates to present their first-class dissertations. Rebecca Aynge and Pauline Shabani explained the core thesis statements behind their research which ranged from an exploration of the cultural appropriation of Black women’s bodies to how humour is used as a coping mechanism for racial microagressions. Concerns that celebrity body culture is providing an amplification of racial stereotypes were present in Rebecca’s dissertation breakdown. Pauline encouraged discussion with her insightful reading of human, racial attitudes. The introductory statement, “You just have to laugh it off”, opened an analysis of the vulnerability of psychological torment that is at the heart of racial microaggressions. The conclusions given by these recent graduates were well received and expressive of the greater issues approached by the group. We look forward to hearing more from the communities brought together on Friday, both Black British Academics and Shades of Noir. The Amazon voucher competition will soon be brought to a close and the winner chosen so make sure you enter for your chance to win a shopping fund, courtsey of yada!